WASHINGTON, DC (August 31, 2007) - The Washington International Horse Show (WIHS), a world-class equestrian event drawing Olympic-caliber competitors from around the nation and the world, announced today it will officially rename the President's Cup Grand Prix to the Gerald R. Ford President's Cup Grand Prix, in honor of former president and horse enthusiast Gerald R. Ford. On Saturday, October 13, 2007, riders will compete in this World Cup Qualifying Class for a total purse of $100,000. The President's Cup Grand Prix is the show's most coveted event. Twenty-five riders will race against the clock to complete 10-14 jumps, ranging in height from 4' to 5'3' with a spread of five to six feet. Grand prix show jumping is the highest level of competition for horses and riders. The horse and rider duo that completes the round the fastest with the least amount of penalties wins the top prize of $30,000. Members of the Ford family, including Susan Ford Bales, will be present on Saturday evening to honor the winners of the Gerald R. Ford President's Cup Grand Prix. Editor's Note: Images available upon request. For images or more information, please contact Kristi Betz directly at 410.427.0123 ext 225 or via email at kbetz@weinbergharris.com. 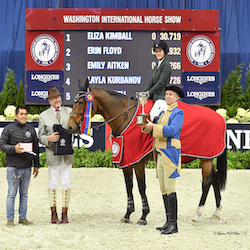 The Washington International Horse Show (WIHS), a 501 (c)(3) charitable organization benefiting local and national charities, is a world-class championship event, drawing leading equestrian riders from around the nation and the world. Each year riders participate in qualifying shows to earn the honor of riding at the WIHS. The WIHS welcomes more than 600 horse and rider duos to compete to win some of the most coveted and prestigious awards in the world, including more than $400,000 in prize money. The show takes place every October in Washington, DC, attracting the attention of the equestrian world, non-equestrian world, celebrities and politicos alike with events such as show jumping, dressage, barrel racing and terrier races. October 2008 will mark the 50th anniversary of the WIHS. The Washington International Horse Show is supported by the following 2007 sponsors: Salamander Hospitality, LLC, Hidden Trail Farm, LLC, FTI Consulting, Inc., Merial, LTD (UlcerGard), Monica & Hermen Greenberg, Canadian National Railway Company (CN), Monarch International, Gotham North, St. Michelle Wine Estates, Lynn Ellen Rice & Last Name Left Productions, Pat Carleton & The Cottonwood, Ltd., Pedigree/Masterfoods, Crawford Communications, Shalanno Farm, Tara Management, Tad Coffin Performance Saddles, Halstrum, LLC/Lubrisyn, Brooke Carmichael McMurray-Fowler & Pam Carmichael Keenan, JPC Equestrian, Betty & Ernie Oare, Berkley Underwriting Partners, LLC & EMO Insurance Agency, Inc., The Reid Family, Hillary Stiff & Chris & Nalini Rogers, Platinum Performance, Far Niente Stables, LLC and Cornell University.